A skull thought to be from the Bronze Age has been discovered by an oysterman dredging the sea bed. 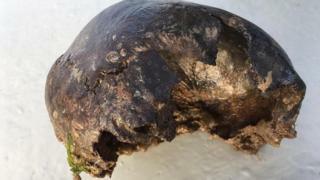 Ross Wey found the ancient cranium, believed to be about 3,000 years old, off the coast of Mersea Island, Essex. It was initially examined by police but Mr Wey said the "lump on the back of the head" was indicative of its age. The skull has been sent to University College London (UCL) for further research. Mr Wey, who has been dredging oysters for five years, said it was "a bit bizarre" when he discovered the human remain. "As this dredge came up there were the oysters and then these pair of eyes looking at me," he said. Mr Wey, who lives on a boat at Mersea Island, said he did not know whether the skull would remain in a museum in London or return to Essex to go to Colchester Museum.